With all the information we now have available on the importance of pollinators, more and more people are interested in planting gardens to benefit them. Not only are you helping the environment, but you get to experience the enjoyment of watching them work. When choosing plants, ones that flower at different times of the year will provide a long season of food and habitat for our pollinator friends. 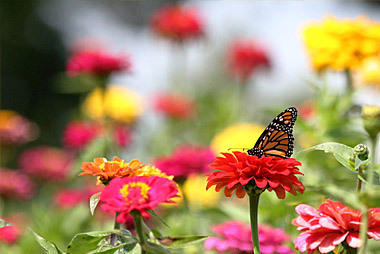 Many plants will attract more than one type of pollinator to your garden. Approximately 75% of the crops eaten (fruits, vegetables, nuts, etc.) require some form of pollinator assistance. Without them, our diets would be drastically limited, and we would not have access to essential vitamins and minerals. There are an estimated 300,000 species of flowering plants in the world that require the assistance of pollinators to thrive. Pollinators help to propagate flowers and seedlings by dispersing their seeds and pollen throughout the environment. They help keep pest insects under control. For instance, ladybugs eat aphids, and birds and bats eat many other insects. Look at the label when choosing plants. Many will say what they attract or deter in terms of animal and insect species. Most pollinators love plants with fragrant, single flowers in purple, yellow, white and blue. Pollinators need plants to provide food, shelter, and a place to raise their young. Choose native plants, trees, and shrubs. 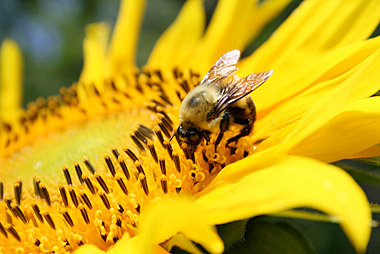 Pollinators tend to opt for plants such as thistle, goldenrod, milkweed, apple trees, and lilacs. Early Season Plants: Snowdrops, hellebores, forget-me-not, grape hyacinth, and crocus. Annual Plants: Cosmos, lantana, marigold (also helps deters mosquitos), sunflowers, alyssum, snapdragons, nasturtium, and salvia. Perennials for Summer: Bee balm, creeping thyme, goldenrod, lilies, heuchera (coral bells), and echinacea (coneflower). Perennials for Fall: Sedum and aster. Select options which allow the butterflies to lay their eggs and caterpillars to feed. Do not have a good sense of smell, and are instead attracted to colour, especially red. Bees are the most important pollinator. There are hundreds of species in Canada alone. The population is declining due to loss of habitat. Bees have colour vision and especially like blue, purple, violet, white and yellow. Larger clumps of flowers are easier for the bees to find. If space allows, plant each cluster four or more feet wide. The flowers need to provide food for the bees. They require nectar and pollen. Utilize a variety of flower shapes. Different types of bees are different sizes and have different tongue lengths, so will feed on different flowers. Birds use trees for building their habitat. They eat a wide variety of insects and pests.